The Moshannon Valley Community Education Foundation recently received an endowment in memory of a member of the Class of 1989 – Christopher E. Reed. The endowments were presented by friend/classmate Gina Mital (Yaple) and his wife, Lizette “Liz” Reed (Gibson). Mital thanked many of Chris’ friends and classmates who helped in establishing the endowment in addition to Lizette Reed, for providing funds to start the scholarship in his memory. The Moshannon Valley Community Education Foundation has collaborated with both Lizette Reed and Mital and the school’s scholarship committee to develop criteria and establish the process for selecting an annual recipient for this scholarship. The inaugural Christopher E. Reed Memorial Scholarship will be presented to a graduating senior of the Class of 2019 at this year’s Awards and Scholarship Ceremony, scheduled Wednesday, May 29th at 5:30 p.m. in the high school gymnasium. Christopher Reed was born July 19, 1971, son of Bonnie (Kowalcyk) and Robert Reed of Houtzdale. Following graduation from Moshannon Valley, he attended Lock Haven University and earned a Bachelor of Science degree in health and physical education in 1994. Shortly after, Christopher Reed began a career with the State Department of Corrections, most recently working at SCI-Houtzdale until his retirement in August of 2018. In 2011, he earned an MBA in Global Leadership through Delaware Valley College. While still in high school, Christopher Reed began his military service and was part of the ROTC program in college. He received his commission as a second lieutenant in 1994 with the Pennsylvania Army National Guard. During a 26-year military career, he was assigned to the 2-112th Infantry Battalion and served honorably during deployments to Kosovo for Operation Enduring Freedom, Iraq for Operation Iraqi Freedom and areas affected by Hurricane Katrina. He was promoted to the rank of first lieutenant in 1996, captain in 1999 and major in 2005 before retiring in 2014. Christopher Reed earned many awards and distinctions during his military career including a Bronze Star Medal, Meritorius Service Medal, Army Achievement Medal, National Defense Service Medal and NATO Medal. Kris Albright, MVCEF president, thanked Lizette Reed and Mital for their generous contribution to the scholarship trust and efforts in starting the scholarship. “The foundation is extremely grateful for their involvement,” he said. “Now knowing Mr. Reed’s continued pursuit of education and service to our country, it is an honor to help establish this scholarship to recognize his legacy. “We look forward to continue working with Major Reed’s family members and friends to recognize the impact that he had on those who knew him best. Currently, the Moshannon Valley Community Education Foundation awards nine other scholarships provided by the generosity and support of community businesses and individuals – the Houtzdale Moose, L.O.O.M No. 327 Scholarship, the Kruise-Spewock Funeral Homes Inc. Scholarship, the Carolyn (Green) Ball Memorial Scholarship, the Children’s Orthopedic Services Inc. Scholarship, the Jeffrey Gallaher Memorial Scholarship, the Alumni Scholarship, the William J. “Joey” Ellis Scholarship, the Christopher A. Souder Scholarship and the Dylan Ludwig Memorial Award. 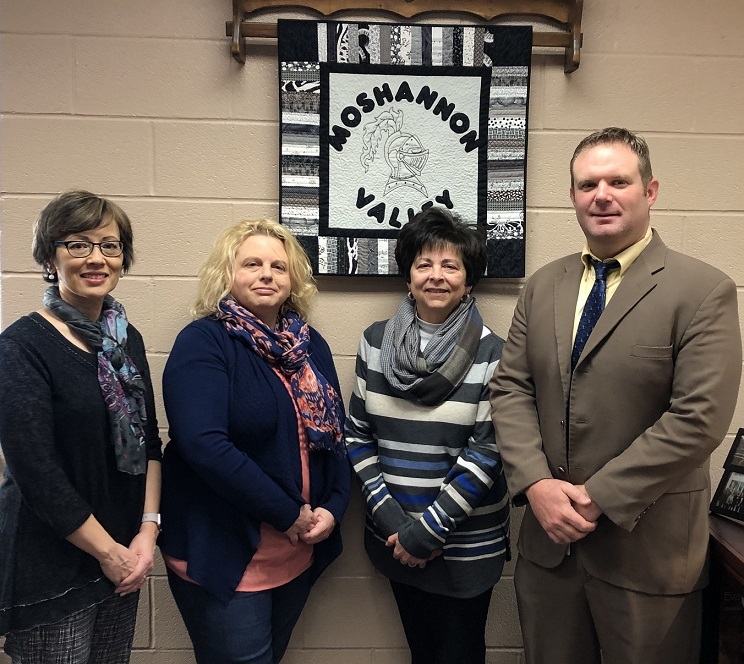 In addition to securing scholarships for graduating seniors, the Moshannon Valley Community Education Foundation supports education in the school district through teacher grants and alumni speakers. Since 2012, MVCEF has awarded nearly $50,000 in educational-related funding to the faculty and students at Moshannon Valley. The MVCEF is an independent, 501(c)(3) non-profit, public charity dedicated to the mission of ensuring the highest level of educational innovation supporting students, faculty and staff, with community involvement, in a partnership of lifetime learning. MVCEF raises funds through alumni donations, bequeaths, grants and EITC contributions from companies and organizations. All financial contributions made to the MVCEF are tax-deductible. If you are interested in starting a scholarship endowment or contributing to the Major Christopher E. Reed Memorial Scholarship trust, please contact Kris Albright at 814-378-7616. Contributions can also be made through the foundation’s Web site: www.movalley.org/MVCEF using the ‘Donate’ button under the ‘Donations/Donors’ tab. Please denote that your contribution is for this scholarship in the comment box. Contributions may also be mailed to MVCEF, 4934 Green Acre Rd., Houtzdale, PA 16651 or submitted directly to the trust account at First Commonwealth Bank in Houtzdale.